nannenjE – Oh the good mind! eppozhudhum – at all times. Your highness said ‘Arkkum annEr niRkai aridhAm [upadhEsa raththina mAlai – 65]’. Asking his own mind whether there is not anyone for this, he (maNavALa mAmunigaL) says there IS one and so wants to show that and says to his mind to nurture this, starting the pAsuram with ‘pinbazhagarAm perumAL seeyar’. 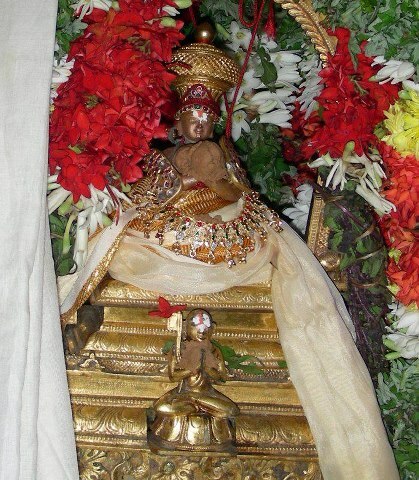 In the previous pAsuram he detailed about protection of svarUpam (AthmA’s nature), and protection of divine body (of AchAryan), in that he keeps for later, the part of AchAryan protecting the AthmA, and considers what is his favorite, that is about protecting AchAryan’s divine body, and shows rarity of disciple’s identity of that, as ‘pinbazhagarAm perumAL seeyar’. He is – a very dear disciple of his AchAryan lOkAchAryar that is nampiLLai, heard all the meanings from his AchAryan and as heard, he is interested only in the AchAryan as said in ‘ellAm vaguththa idamE [SrI vachana bhUshaNam – 453] (place of learning, etc., are all what is set for the disciple – that is, the divine feet of AchAryan), and without separating from him for even a second, and involved in doing services to him, such pinbazhagiyarAm perumAL seeyar. he (pinbazhagiya perumAL jeeyar) would say ‘kuRuvEr parambina thirumukha maNdalaththil sEvaiyaiyum , suRRich chuzhaRRip parimARugiRa kainkaryaththaiyum vittu adiyEnukkup paramapadhaththukkup pOga ichchai irundhadhillaiyiRE [vArththA mAlai – 174]’ (~ I have not had the wish to go to paramapadham by leaving here the divine view of my AchAryan’s divine face having small drops of sweat (after he comes out taking bath in the river), and the service of fanning for him). mikka AsaiyinAl nampiLLaikkAna adimaigaL sey – that is, as said in ‘thEsArum chichchan avan seer vadivai Asiyudan nOkkumavan [upadhEsa raththina mAlai – 65]’ (the disciple of greatness would take care with affection the divine body of AchAryan), all the love in that other place is all channeled into the matter of kainkaryams for his AchAryan nampiLLAi. So, for him that paramapadham would not be sweet. nampiLLaikkAna adimaigaL sey annilaiyai – that is, the way in which he performed kainkaryams, in all the ways like fanning and other appropriate ones according to time and situation, as said in ‘ichchA prakruthi anuguNair upachArais sadhOchithai:’, that is, kainkaryams to his AchAryan nampiLLai who is always immersed in protecting this disciple’s AthmA, and who can issue token to go to paramapadham, and who is the matter set out for this disciple. UnamaRa eppozhudum Or – In the same way at all the times continuously be thinking about that charama parva nishtai, that is servitude to AchAryan. Repeatedly doing kainkaryam is the instigated by the level of interest in it. That is, the state of vaduga nambi (is his wish). and my (piLLai lOkam jeeyar’s) parmAchAryan (AchArya’s AchArya – paravasthu pattarpirAn jIyar) who shines being in anthimOpAya nishtai (ultimate state – servitude to AchAryan), too, divined this in the same way. In the pravESam (entry/introduction) to the vyAkyAnam of yathirAja vimSathi, appiLLai too divined this as ‘SEshithva, SaraNyathva, prApyathvangaL mUnRum piLLai vishyaththilE anusandhiththu, thadhEka nishtarAy ezhundharuLiyirukkiRa jeeyar’ (jeeyar (maNavALa mAmunigaL) is present with the thinking of (thiruvAimozhip) piLLai as having the qualities of being a head, shelter, and goal. This entry was posted in Other, upadhESa raththina mAlai and tagged 74, annan, erumbi, erumbiappa, jeeyar, jIyar, kovil, mamunigal, manavala, nambillai, nampillai, pasurams, perumal, pinbalagiya, pinbazhagiya, rathina, rathinamalai, raththina, raththinamalai, seeyar, upadesa, upadhesa on February 6, 2016 by raghuram.